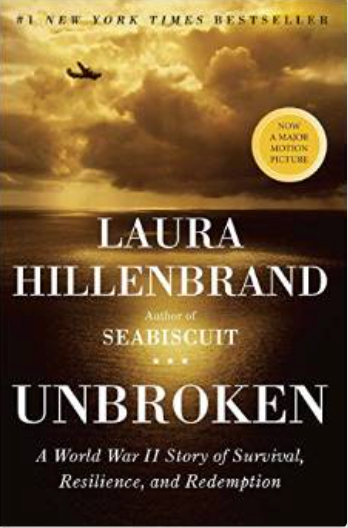 This novel is the true-life tale of Louis Zamperini, the Olympic track star who survived a plane crash in World War II, only to fight for his life against nature and eventually as a prisoner of war. Louis grows up a rough-hewn kid on the verge of becoming a full-on delinquent, until his brother starts training him to be a track star. He excels at the sport, and eventually represents America at the 1936 Summer Olympics in Berlin. During his training, he learns to become resilient and disciplined; his brother’s words of advice, “If you can take it, you can make it,” push him to overcome any adversity. He must live up to that adage under the most extreme circumstances after his plane is shot down during another bombing raid. He is stranded at sea for more than a month, only to be found by the Japanese and forced to endure constant physical abuse at the hands of sadistic prison-camp guard Mutsuhiro Watanabe, who wants to break Louis’ indomitable spirit. Louie, with his defiant and unbreakable spirit, was Watanabe’s victim of choice. By war’s end, Louie was near death. When Naoetsu was liberated in mid-August 1945, a depleted Louie’s only thought was “I’m free! I’m free! I’m free!” But as Hillenbrand shows, Louie was not yet free. Even as, returning stateside, he impulsively married the beautiful Cynthia Applewhite and tried to build a life, Louie remained in Watanabe’s clutches, haunted in his dreams, drinking to forget, and obsessed with vengeance. With no help for their as yet unrecognized illness, Hillenbrand says, “there was no one right way to peace; each man had to find his own path….” The book’s final section is the story of how, with Cynthia’s help, Louie found his path. This is a riveting tale of heroism, cruelty, life, death, joy, suffering, remorselessness, and redemption. I haven’t seen the movie, only the trailers, other ads and interviews with him. But I need to. You see today I visited with Mark in prison and he tells me that he loaned this book to an atheist friend of his in prison without telling him what happens in the book. You see Louie was almost destroyed (broken) by the war and all that happened to him. His life was in ruins, drinking every day, drunk all the time, nightmares about the cruelty, and his wife was leaving him. But she went to hear this new young evangelist named Billy Graham. She was converted to Christianity and decided not to divorce Louie. But she kept after him to go and hear Billy. He did and his life was changed forever… he had a new life. Mark’s friend came back to talk with him after he read the book and unexpectedly found Billy Graham. He and Mark talked. Wouldn’t it be wonderful if there was some seed planted because a friend loaned a book about being “unbroken” to a friend who was broken and didn’t know it!!! Every story about courage in the face of cruelty, about being and remaining unbroken is worth telling. I pray that we all will feel unbroken, whatever we are facing, because of the love of Christ. Amen. PS. Please remember our next door neighbor, Whitney (26) years old who has spent most of Nov. & Dec. in the hospital needing a liver transplant. She is not on the list and not sure she can get on it. Thank you for lifting Mark up as a good example of a Christian. I will send this to him. Unbroken .. .Mark M Hey my friend. I have told Mark that he can do wonderous things no matter where he is! Iam so proud of you! Can’t wait to read your books! Give Shirley a hug.